“We have a great teacher community; we can count on each other, as the students can count on us. Our most important mission is to maintain and grow.” This year, we had the opportunity to support the Hungarian Christian High School in Léva with donations from the Transtibiscan Reformed Charity Ball. In preparation for the event, we visited the institution in southern Slovakia (in Hungarian called Felvidék) to see the everyday life of the smallest Reformed school in the Carpathian Basin. “Per spinas ad rosas” – through the thorns to the roses – this caption, originating from Péter Czeglédi, a galley slave and a pastor, who was dragged to Italy and later returned to continue his service, greets every visitor to the Hungarian Christian High School. The official Hungarian name of the school carries his name, and the school’s staff follows his late words in their duties today. On the mission of the high school, Principal Beáta Kiss sums that Czeglédi is the example of perseverance, loyalty and fidelity to principles, and these are the values that the staff would like to give to the next generation. 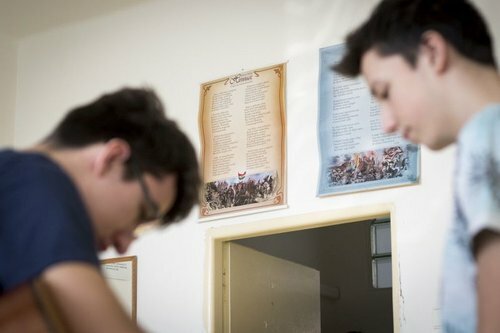 We soon found that perseverance and fidelity are very much needed here, as there are only two Hungarian high schools in Felvidék – one in Léva (in Slovakian, Levice) and the other in Rimaszombat (in Slovakian, Rimavská Sobota) – and the former’s population counts only 8% of Hungarians. In Léva, you can barely hear Hungarian being spoken. The Hungarian school signifies home and solidarity in an area where there is a Slovakian majority. The principal says that they are truly grateful that they are able to speak in their mother-tongue while working, it is exceptional. We experience what it really means to be the smallest high school while we are walking in the corridors. Altogether, forty students study here, gathered in classes of 8-12, giving a familial and supportive atmosphere. “At first, those who come here to study are afraid of the small class number, but after a few months, they realize what a great source of energy it is,” explains Principal Kiss. The institution was started in 2001 with the help of the Reformed Congregation of Léva, after successfully regaining a property, previously seized by the state in the socialist era. After a long legal process, the school started its first year with only one class and ten teachers. Despite the school’s size, nearly 100% of the students apply to higher education opportunities, and students are accepted to universities everywhere in the Carpathian Basin, including Debrecen, Komárom, Miskolc, Brno, and Budapest. We learned that the high school moved to its current building three and a half years ago to share grounds with the pre-school and primary school maintained by the municipality. “Our aim was to create a Hungarian institution center, where students may experience unity, and educators can help one another. The former building runs as a dormitory, so we that are able to accept students from places far away. Today, a quarter of our students are boarding,” adds Principal Kiss. Although the condition of the rented building is not the best, students and teachers have put great effort in making the classrooms and corridors cozy. We found embroideries in a flight of stairs which reminds us of paintings on coffers made by the principal and teachers. Between lessons, we had the opportunity to ask the students more about the school. We met with graduate student René Kovács, who travels from the nearby town of Érsekújvár to school every day. “I started primary school in Léva, and from my class, four of us continued our studies here. Now there are eight of us in our year,” said the young man. He added that he did not choose the institution primarily because it is Reformed, but rather because he was willing to learn in Hungarian. Ever since he began studying here, he has been playing the accompaniment for the children’s choir on holidays at church services in his hometown. Though Rebeka Szőlősi will graduate in two years, she prepares enthusiastically for university, “I am also interested in languages, and I am considering choosing a university in Budapest.” The second year student started high school at another institution, but she didn’t want to live in a dormitory, so she changed school after two months. Zsanett Líška helps to organize the recruitment program, planning two open houses and several recruitment tours every year. The teacher denies the general assumption that a small school means less work – contrarily, in order to deal with the large amount of tasks, the teachers need each other. “We have a great teacher community; we can count on each other, as the students can count on us. Our most important mission is to maintain and grow,” she said. We end our day in the principal’s office, where we asked of the everyday difficulties of the small community. “An outsider may think that the low number of students refers to the low level of education. 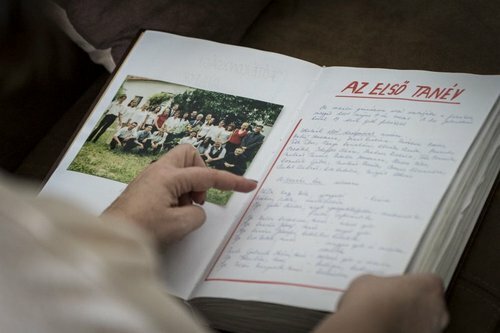 In truth, it’s just that very few Hungarian families live here,” explained Principal Kiss. 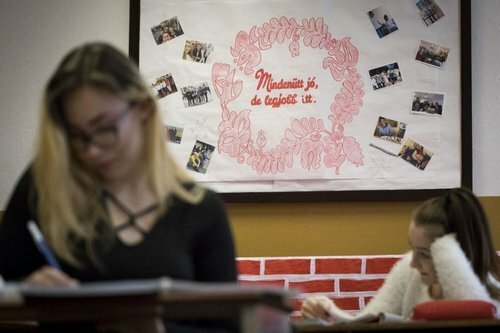 The assimilation is very strong in the region: although children may attend a Hungarian primary school, the majority of students later choose to go to a Slovakian high school. As state subsidy is given according to the number of students, in our case, the small number of students causes financial difficulties – and for that reason we are supported by the Hungarian government. The Hungarian youth only see small communities, and soon start to dream about leaving to bigger towns and to more Hungarian communities. This drives them to start high school in Hungary or in Hungarian Reformed boarding schools,” explained the principal. “Despite the difficulties the greatest motivation for me is to hold on to this Christian-Hungarian school. This is the case for me,” accentuated Principal Kiss. Christian education is evident in Bible classes, spiritual events, church services, and weekly devotions. 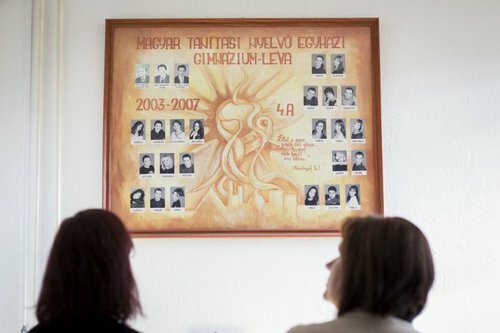 Although the high school functions in the frameworks of the Reformed Christian Church of Slovakia and belongs to the Reformed congregation of Léva, it has an ecumenical approach: the majority of the small Hungarian population in Léva is Catholic, so about half of the students are Catholic. “We encourage our students to visit their own congregations on Sundays, that’s how the school serves the local church communities, and through this the whole Hungarian community of Léva,” added the principal.